When you arrive at YouTube before you’ve taken the trouble to create an account, you see the pure, innocent YouTube of the viewer with no viewing history. Treasure this moment, this innocence, this pure instant of seeing the site as it is. You’ll soon be a jaded viewer, with a viewing history filled with reminders of the hours spent watching One Direction videos. Have a look to see what YouTube looks like to the user who is logged out. 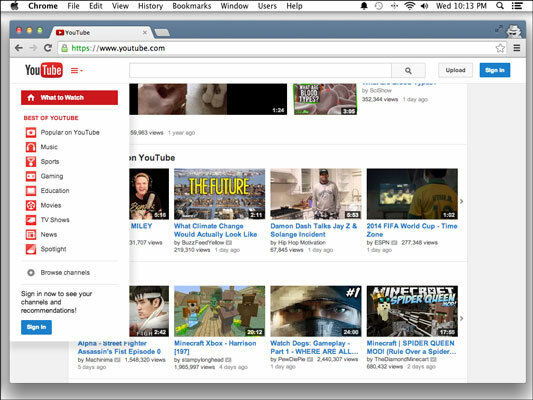 The logged‐out YouTube home page. On the left side of the screen, you see a list of links to the Best of YouTube channels. These verticals, as they’re called, are the primary content divisions on YouTube. Verticals are sort of like the sections of a newspaper. Like a newspaper, YouTube is organized into sections so that you can find the type of content you want to watch. You can subscribe to any of these verticals like it’s a normal user channel. The programming on YouTube is divided into verticals. (Anywhere else, these content divisions would be called genres.) Verticals are all a combination of YouTube native content (content produced by regular YouTube users) and content produced by traditional media companies like CNN and The Onion. One amazing aspect of YouTube is that individuals can still manage to have a voice just as loud as the major media players. Popular on YouTube: This one is very much what it sounds like — a channel filled with what’s currently popular now on YouTube across diverse categories, from news to music videos and everywhere in‐between. It’s also a great way to keep up with what’s hot in contemporary culture. Music: Music is a big deal on YouTube. Twenty‐two of the 100 most‐­subscribed channels are music channels. Though MTV once showed music videos, that niche is now filled by YouTube, and much of that traffic is dominated by VEVO, which offers music videos from big‐name entertainment conglomerates such as Universal Music Group and Sony Music Entertainment. Sports: Sports videos are also extremely popular on YouTube. The Sports vertical is an interesting blend of mainstream sports video from sources like ESPN, the NFL, and other major sports leagues, to ­parkour and extreme sports videos shot with the extremely popular GoPro camera line. Gaming: This vertical is one of the most mysterious. It has, of course, the content you’d expect, including promotional videos from game publishers, reviews and news from established video game voices like IGN, reviews from YouTube users, and content from some of the largest multi‐channel networks, such as Machinima. The Gaming vertical is also the home of the Let’s Play genre, one of the most popular on YouTube. Creators such as PewDiePie and Sky Does Minecraft garner millions of viewers posting videos of themselves playing popular video games and commenting on the gameplay as they play. These videos are hugely popular, and Minecraft demonstrations especially have a huge audience of young people on YouTube. Education: In the Education vertical, you’ll find a wide range of educational videos. Universities and education foundations are very active, but it also has many YouTube natives, like the Khan Academy, CGP Grey, Minute Physics, Crash Course, and SciShow. Language learning is another immensely popular subsection of the Education vertical. Movies: This one is home to YouTube’s movie rental business. You can rent Hollywood releases for streaming here, but we’ve never heard of anyone doing that. Some free movies are available and are worth checking out. TV Shows: In the TV Shows section, viewers can rent — you guessed it — streaming television shows. News: The News vertical consists of channels that cover a wide range of beats, including national news, world news, science, sports, entertainment, and so on. Live: You can catch live events from gaming to music to sports and much more. Spotlight: This is somewhat different from “Popular on YouTube” in that it itemizes what’s new and emerging. Because it covers a collection of topics, you may find yourself spending more time in this section than you originally planned. Browse channels: Consists of a summary look at channels across different categories and interest groups. You can get a look at the home page without all the baggage of your past video views at any time. That way, you’ll be sure to see (unfiltered) what’s trending on the site. Just put your browser in a private browsing mode, such as Chrome’s incognito browsing, and you’ll see the YouTube home page with new eyes. You’ll see which videos are hot on the site without any of the context of your past browsing. In Apple’s Safari browser and Mozilla Firefox, incognito browsing is called private browsing. In Internet Explorer, it’s called InPrivate browsing.